President Obama signed a new law designating the Bison as the official mammal of the United States. Just to clear up some confusion, many people will inevitably ask, “what’s the difference between a bison and a buffalo?” There is no difference. An American Bison and an American Buffalo are the same animal. Feel free to use the terms interchangeably. 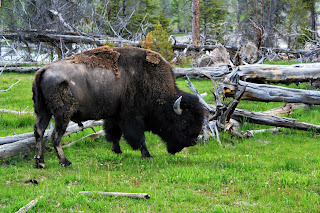 I’ve had a personal fascination with the bison from the first time I saw one up close the first time in Yellowstone National Park 15 years ago. I was driving into the park from Cody Wyoming and a bison was just meandering down the middle of the road causing a 5-mile traffic jam in both directions. Hundreds of people outside of their cars following him down the road taking pictures. For an animal that once teetered on the brink of extinction, they seem to do pretty well in Yellowstone. They may appear docile and move at about the speed of a cow when they’re relaxed, but a bison can sprint up to 35 miles an hour when they want to (That’s 7 miles an hour faster than Olympic gold medalist Usain Bolt’s fastest ever recorded speed). Park rangers in Yellowstone routinely tell stories about tourists who try to mount and ride bison in the park. 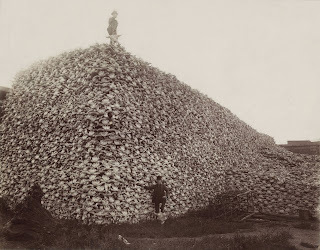 Stories of parents trying to put their kids onto the backs of bison for photos are also not uncommon. In the summer of 2015, there were five separate incidents where tourists were gored by bison in a single season. None of the five attacks were fatal, but there have been human fatalities caused by bison inside the park in other years. Now that you know a little about our new national mammal, you might want to know if you can eat one. Unlike the bald eagle which is federally protected and cannot be hunted or killed, you can actually eat a bison. 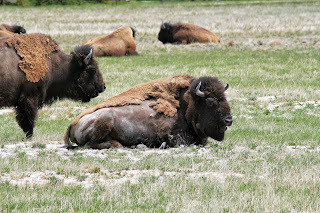 Although there are only about 5,000 wild buffalo in Yellowstone NP, over 100,000 bison also reside on private farms and ranches all over the US. Many of these animals end up on the dinner table. You can find buffalo burgers on the menu in restaurants throughout Idaho, Montana, Wyoming and South Dakota. Nearly every roadside gas station in the pacific Northwest seems to sell buffalo jerky. So how does a buffalo burger taste? Pretty damn good, I’d say. It’s leaner than regular beef, a little tougher and a little gamier. I highly recommend checking out the Gun Barrel if you’re ever in Jackson Hole Wyoming and hankering to try buffalo. They serve buffalo at least six different ways, all of them delicious.